Udupi, Nov 30, 2015: A first of its kind in the State, the introduction of CCTV cameras in private buses has come as a possible move in the backdrop of the increasing disturbances within the buses, especially against women passengers. The attempt is also expected to be instrumental to detect the irregularities that take place inside the buses. Some bus drivers and conductors, who behave rudely at times, are now under constant vigilance and accountable for their behaviour and attitude. The cameras have been installed in the buses owned by Bharathi Motors, which has route permits across the Dakshina Kannada district and Bengaluru. On an experimental basis, two buses have been fitted with three CCTV cameras each - two inside the bus and another in the front. Each CCTV camera costs Rs 30,000. 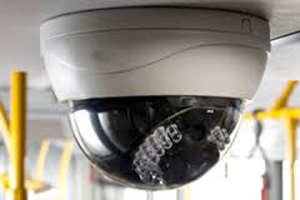 The CCTV camera is directly linked to the online screen that is displayed in the office of the bus owner. The GPS-fitted camera reveals the timings maintained by the buses and also the other facts like the speed, negligent driving and the activities within the bus. Bharathi Motors Proprietor Raghavendra Bhat said that the plan benefits both bus owners and passengers. It will help bus owners to keep an eye on the drivers and conductors. The passengers can now heave a sigh of relief, as the drivers and conductors will be extra cautious over their behaviour, he stated. Another advantage of the CCTV camera is that it exposes the causes of accidents, and the police would have the required information secured through the CCTV camera footage, he said. He said most of the times, the drivers are targeted for accidents and the police point at them for speed and reckless driving, though there may be other reasons. The other party involved in the accident may be responsible too as is often seen. Yet the drivers are blamed. The CCTV camera records consistently, the data collected will be safe for one month. Implemented abroad wherein the buses are compulsorily fitted with CCTV cameras. Why should we not implement this initiative here to experiment it in our own buses. The crimes taking place inside the buses, can be detected effectively. Inspite of installation of CC camera’s the crimes are increasing everywhere.Sometimes hey even disconnect the wires before performing any crime.